Writing about major historical figures is always a risk for a serious novelist; one must imagine thoughts and conversations for which no record exists, and integrate pertinent facts about peripheral people who figure in the story. 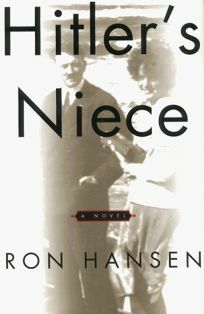 For the first few chapters of Hansen's (Atticus) ambitious, provocative new novel, this problem seems likely to overwhelm his attempt to plumb the narrative's central question: what really happened to Hitler's 23-year-old niece, Geli Raubal, who was found dead, purportedly a suicide, in her room in Hitler's apartment, in 1931. Hansen has another task here as well: to convey how a mentally unstable, self-pitying failed painter became chancellor of Germany. He introduces the 19-year-old Hitler at the nadir of his fortunes in 1908, the year his niece Geli was born, traces the source of Hitler's monomaniacal mission to ""save Germany"" to a battlefield experience in WWI and portrays the effects of his spellbinding oratory and instinctive grasp of mass psychology on a shamed and economically devastated populace. Sometimes the sheer mass of information Hansen must provide results in a listless series of mini-bios of people who became Nazi stalwarts, in off-stage action scenes and in the past perfect tense: ""the police had hesitated... had fired a salvo... Scheubner-Richter had been killed,"" a device that dangerously slows narrative momentum. But always the drama swings back to high-spirited, fun-loving, irreverent Geli, and Hitler's sexually deviant need to dominate her. Midway through the novel, the confluence of historical event and personal destiny becomes mesmerizing, as we perceive the torment of a sexually molested, psychologically manipulated woman, isolated and virtually imprisoned by a jealously possessive monster. The finale imagines Geli's death in a completely credible way, and leaves us with fresh insights into Hitler's twisted personality. The reader forgives the occasional longueurs in this textured picture of Hitler's histrionic personality and his insane mission for glory, presaging the genocide to come in the cold-blooded obliteration of one young woman's life. 8-city author tour; simultaneous audio. (Sept.) FYI: Ronald Hayman's Hitler and Geli will be released by Bloomsbury in August.